Treat yourself to the finest jewels in this magnificently designed slot game that was made to be worth your while. If you've ever dreamed of what it was like to live like royalty then this is the game for you. Realm of Riches features 20 lines and 5 reels. The game allows players to wager as little as one cent or as much as $100. You'll want to look for the crown which is the wild card and the shield scatter symbol. You can either change these amounts after each round or just use the "Autoplay" mode to play through several spins with the same settings. Ready to Rule? Play Realm of Riches for Your Chance at a Fortune. 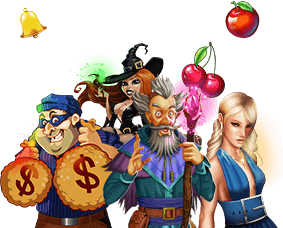 Realm of Riches online Slots takes you back to the kingdom of the medieval times ruled by royal emperors. You can explore the rich world of silken clothes and glowing gemstones in this online free slots game. Realm of Riches has stunned many a big shot gambler with the razzle-dazzle of the Las vegas-based Excalibur Hotel-Casino, brought to players in bits and bytes on their computer screens. The precious gem-studded crown across the reels help you substitute all icons on the reel except the shield (scatter symbol), to get you rewarding combinations. The help button gives you details about this kingdom of royal riches. The bet button gives you the liberty of raising or reducing the value of your bets per line and per spin. On every line you can place the bets worth $0.01, $0.02, $0.05, $0.25, $0.50, $1.00, or $5.00. The convenient option of auto-play button lets the Realm of Riches online Slot machine play the game automatically for you. Unless you run out of cash, the machine will continue with the step by step game-play based on the options that you have selected. You can manually stop the auto game-play by hitting the stop auto button. Every player who logs into online casinos had a fond hope of reliving the game experience at the land establishments of casinos. At the same time, no player wants to compromise on the quality of animation and sound effects that the virtual casino gives. So, here is the perfect answer: a game of Realm of Riches. But here is a friendly tip: If you want to get the full worth of your money, then make sure you have the high-quality Flash player and sound card installed in your computer systems. Payline: The term payline is used to denote the amount of lines across the screen on a slot machine. Free Spins: Free spins are the free games that can be won by satiating certain preset requirements. Wild symbol: Studded with precious gems, the crown of the king is the wild symbol in the Realm of Riches online casino Slot. You can effectively produce winning combos by replacing the other symbols with the image of crown. Scatter symbol: The protective shield acts as the scatter symbol in this online casino Slot. If two or more icons of the scatter symbol drops on any of the active reels, it can impressively increase your total value by three times.